A good resume is easy to read. One point to remember is that, a resume is a summary, not an autobiography. Use concise, unambiguous sentences and avoid over-writing. The reader is likely to be busy and not inclined to struggle through flowery prose. Keep your resume length short, if you are a fresher. Depending upon your experience, one or two pages is ideal. 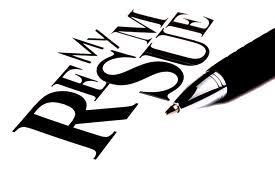 A three-page resume should be considered only if it is absolutely necessary to do justice to your career experience. When you include an objective on your resume, it's important to tailor your resume objective to match the job you are applying for. The more specific you are, the better chance you have of being considered for the job you are interested in. It's important to include all your contact information on your resume so employers can easily contact you. Include your full name, street address, city, state, and zip, home phone number, cell phone number, and email address. Stress your past accomplishments and the skills you used to get the desired results. Your accomplishment statements must grab the reader, and quantify the results. Focus on information that is relevant to your own career goals. If you are making a career change, stress what skills are transferable to support your new career objectives. It is important to prioritize the content of your resume so that your most important and relevant experience is listed first, with key accomplishments listed at the top of each position. Your resume should be well-structured. A poorly structured, badly typed resume tells the reader much about the applicant. In case if you are sending an email resume, it is important to follow the employer's instructions on how to submit your cover letter and resume. The employer may want your resume attached to the email message and sent in specific format, typically as a Word dcocument or a PDF. Enclosing a photograph of yourself is not necessary. Do not use photo copy /xerox of resume. There is a risk of print quality. Always use freshly printed resume. Avoid odd-size paper or loud colors. 8 1/2 X 11-inch paper — in white, buff or beige, is appropriate. Be sure to use a good quality paper. Your salary history or reasons for leaving previous jobs should never be included in a resume. In addition, leave out any discussion about hobbies, musical instruments you play, sports you enjoy, your marital status (with the number and gender of kids), age or race. This is a business marketing document, so limit the information on it to business related issues. Do not include references to areas of your life that are not business related, or have nothing to do with your current career goals. Membership in outside social organizations, military service, etc., have no place in a resume, unless they somehow apply to your job objectives. 0 Response to "Resume Writing: Dos and Don'ts"